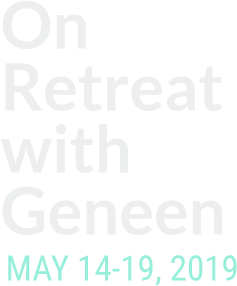 The retreat tuition is based on housing type and includes your housing and all meals (from dinner on May 14th through lunch on May 19th). Private rooms are not available. Because we want everyone to be comfortable, we take special care in creating the housing plan and matching roommates. The different room choices are limited, and will be allocated on a first-come, first-serve basis. Register early to ensure your preferred housing! $2,495 Double Room – Hotel-style or house-like buildings (no phones, TVs or private baths) with shared (but private while in use) bathrooms . $2,495 Double in Cabin – Located in a forest grove and include electricity and heat, but no indoor plumbing. A separate shower house with private shower and dressing rooms, and clean, well-ventilated privies are nearby. $2,445 3-4 Person Rooms – Hotel-style or house-like buildings with shared (but private while in use) bathrooms and showers. $2,395 7 Person Rooms – House-like buildings with shared (but private while in use) bathrooms and showers. $2,345 Dorm (14 people) – Located in a house-like building with shared (but private while in use) bathrooms and showers. Each person has a twin bed, bedside table and lamp (no bunk beds). This space is available to quiet sleepers only. $2,295 Tents – Provided by the Center, the tents are set up with a foam mattress, but no bedding (bring your own). A separate shower house with private shower and dressing rooms, and clean, well-ventilated privies are nearby. Tents are an option for those who want single housing. $2,295 Van/RV – There are a few spaces for you to bring your own Van or RV, and these include access to electrical hookups but not water hookups. You will have access to bathroom facilities in adjacent buildings. $595 down payment ($350 non-refundable/non-transferable). Payment by accepted credit cards or check (made payable to “Geneen Roth & Associates Inc.”). Balance of retreat fees are due upon confirmation of accommodations and will be processed to the credit card provided for deposit (or contact us at 703-401-0871 with updated payment information). Late Registration Fee of $95 is applied after May 1, 2019. Cancellations must be requested in writing to “Geneen Roth & Associates, Inc.” (email, fax, or USPS). Cancellations received 12 weeks or more prior to the first day of the retreat (by February 19, 2019): You will receive a full refund less a $350 non-refundable/non-transferable administration fee. Cancellations received between 12-8 weeks prior to the first day of the retreat (by February 19, 2019): You will receive a 50% credit of the registration fee to be transferred to the next scheduled Women Food and God Retreat with space available. This credit is available only if your cancelled space is filled with another registration prior to the start of the retreat. The credit is null and void if not used at the specified retreat. Cancellations received less than 8 weeks in advance of the first day of the retreat (after March 19, 2019): No refunds, transfers or credits will be given for any reason.